Brunt, Alan; Walsh, John (2005). 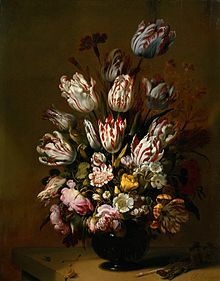 “'Broken' tulips and Tulip breaking virus” (英語). Microbiology Today (Microbiology Society) (May 2005): 68-71. http://www.microbiologysociety.org/publications/microbiology-today/past-issues.cfm/publication/microbes-in-the-garden. Dash, Mike (1999). Tulipomania: The Story of the World's Most Coveted Flower and the Extraordinary Passions It Aroused. London: Gollancz. ISBN 0-575-06723-3. French, Doug (2006). “The Dutch monetary environment during tulipomania” (PDF). The Quarterly Journal of Austrian Economics 9 (1): 3–14. doi:10.1007/s12113-006-1000-6. https://www.mises.org/journals/qjae/pdf/qjae9_1_1.pdf 2008年6月24日閲覧。. French, Doug (2009). “2 Tulipmania”. Early Speculative Bubbles and Increases in the Supply of Money (2nd ed.). Ludwig von Mises Institute. pp. 11–18. ISBN 978-1-933550-44-2. https://mises.org/library/early-speculative-bubbles-and-increases-supply-money. Galbraith, John Kenneth (1990) (英語). A Short History of Financial Euphoria. New York: Penguin Books. ISBN 0-670-85028-4. Garber, Peter M. (1989). “Tulipmania”. Journal of Political Economy 97 (3): 535–60. doi:10.1086/261615. Garber, Peter M. (1990). “Famous First Bubbles” (英語). The Journal of Economic Perspectives (American Economic Association) 4 (2): 35–54. doi:10.1257/jep.4.2.35. JSTOR 1942889. Garber, Peter M. (2000) (英語). Famous First Bubbles: The Fundamentals of Early Manias. Cambridge: MIT Press. ISBN 0-262-07204-1. Goldgar, Anne (2007). Tulipmania: money, honor, and knowledge in the Dutch golden age. Chicago: University of Chicago Press. ISBN 978-0-226-30125-9. https://books.google.ca/books?id=gViwLbCJ7X0C 2015年2月21日閲覧。. Kindleberger, Charles P.; Aliber, Robert (2005) (英語). Manias, Panics, and Crashes: A History of Financial Crises (5th ed.). Hoboken: Wiley. ISBN 0-471-46714-6. Knight, Timothy (2014) (英語). Panic, Prosperity, and Progress. Wiley. ISBN 978-1118684320. Krelage, Ernst Heinrich (1942) (オランダ語). Bloemenspeculatie in Nederland. Amsterdam: P. N. van Kampen & Zoon. http://www.dbnl.org/tekst/krel002bloe01_01/ 2017年3月13日閲覧。. Malkiel, Burton G. (2007) (英語). A Random Walk Down Wall Street (9th ed.). New York: W. W. Norton. ISBN 0-393-06245-7. Nusteling, H. P. H (1985) (オランダ語). Welvaart en werkgelegenheid in Amsterdam, 1540-1860: Een relaas over demografie, economie en sociale politiek van een wereldstad. Bataafsche Leeuw. ISBN 9067070823. Ricklefs, M.C. (1993) (英語). A History of Modern Indonesia Since c.1300 (Macmillan Asian History) (2nd ed.). Palgrave Macmillan. ISBN 978-0333576892. Schama, Simon (1987) (英語). The Embarrassment of Riches: An Interpretation of Dutch Culture in the Golden Age. New York: Alfred Knopf. ISBN 0-394-51075-5. Schama, Simon (1997) (英語). The Embarrassment of Riches: An Interpretation of Dutch Culture in the Golden Age (paperback ed.). New York: Vintage. ISBN 0679781242. Shiller, Robert J. (2005). Irrational Exuberance (2nd ed.). Princeton: Princeton University Press. ISBN 0-691-12335-7. Thompson, Earl (2007). 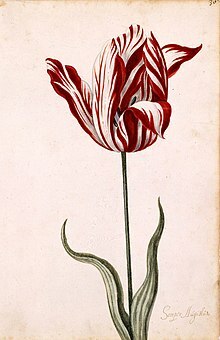 “The tulipmania: Fact or artifact?”. Public Choice 130 (1–2): 99–114. doi:10.1007/s11127-006-9074-4. https://link.springer.com/article/10.1007/s11127-006-9074-4 2008年8月15日閲覧。. Pavord, Anna (2007). The Tulip. London: Bloomsbury. ISBN 0-7475-7190-2. Pollan, Michael (2002). The Botany of Desire. New York: Random House. ISBN 0-375-76039-3.